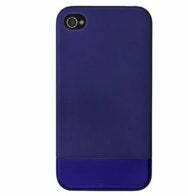 AG Finding's Beetle Case for the iPhone 4 ($35, exclusively through AT&T) is a simple, lightweight case that protects your iPhone with a shock-absorbing liner and comes in a variety of eye-catching colors. Agent 18 has released a rugged, eco-friendly iPhone 4 case called the EcoShield+ ($40). An improvement on the company's original EcoShield case, the EcoShield+ includes a built-in, rotating stand and sports a design that amplifies the iPhone's speaker. 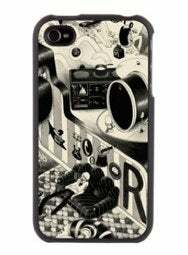 Have you ever wanted to design your own iPhone Case? Case Hut's Design your own iPhone Skin ($20) lets you do just that. Simply send in an image or design of at least 150dpi, and the company will print your image on its case for you. If you're concerned about the effects of radiation emitting from your mobile phone, Case-Mate's Bounce suite of smartphone cases ($50; information not yet on Website), set for release in early Q4, are designed to redirect radiation away from your head. The company has also partnered with Nordstrom to release 25 new Nordstrom-exclusive fashion cases for the holidays. These cases will be available in early November and will range in price from $20 to $90. Dexim's first line of iPhone 4 cases include the BluePack S10 Premium Leather Power Case ($80), which doubles as both a leather case and portable battery pack; the P-Flip 3 in 1 Bundle Pack Foldable Power Dock ($70), which includes a Thermoplastic Polyurethane case, a nifty foldable, portable power dock, and a USB cable; and the colorful, transparent CYL Premium Silicone Case for iPhone 4 ($20). 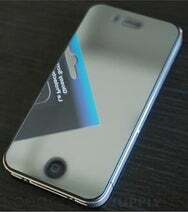 Green Onions Supply's Front Mirror Film Protector for the iPhone 4 is a glossy protector for the front panel of your iPhone 4 that gives your iPhone display a mirror-like quality when it's turned off, but becomes transparent when the display is in use. It's set for release later this month, and pricing info is not yet available. What would a case round-up be without something from Incase? The case-making veteran has released the Monochrome Slider Case for iPhone 4 ($35), which features a metallic, soft-touch coated top and a high-gloss, chrome button piece in lovely coordinating hues. This long-time Apple accessory maker has a new battery case on the market. 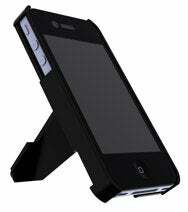 The PowerGuard Battery Case with Card Stand ($60) provides hours of extra juice for your iPhone 4. It also features a handy slot on the back that lets you use the included card—or even a credit card—to prop up your iPhone for handsfree video watching or FaceTime chats. Speck's new Artsprojekt cases for the iPhone 4 ($40) are form-fitting, lightweight cases with some serious artistic flair. The various designs are printed on soft fabric that's then fused to Speck's hard-shell fitted protective case. Designs include the Fatigue, Stone, A Tribute To Music, and more. Trident Case has announced its new Kraken Case Series for the iPhone 4 ($35). This polycarbonate case features an outer silicone sleeve with extra padded corners, and an ergonomic design meant to provide a secure grip. On the eco-friendly side of things is TRTL BOT with two U.S.-made cases constructed from recycled plastic. The Kickstand 4 ($30) features a viewing stand that props up your iPhone, making it ideal for FaceTime and viewing media, while the Minimalist 4 ($30) bills itself as a wallet substitute that can hold up to three ID or credit cards while adding minimal bulk. XtremeMac released a slew of iPhone 4 cases this week. The Tuffwrap ($20) is made of form-fitting silicone that's designed not to stretch out over time, while the Tuffwrap Accent ($25) offers the same style and protection as the original Tuffwrap, but features a two-tone design (a black back with your choice of edge color). The Microshield ($20) is a thin, hard-plastic case that offers a simple look with solid protection, and the Microshield Accent ($25) is the same product but with a clear back and colorful edges.